What is happening in our parish? William Eyton, the Commissioner administering the enclosure of Clun Forest, allotted one twelfth of the common land to the earl of Powis, some around Weals Farm. In 1871 the parish population had risen to 561, many in the new houses in the west. In response, on Weals ground in 1874 the Earl built Bettws y Crwyn School and School House at a cost of £800. The stone used for the building probably came from the Tabernacle quarry. The style is traditional, with special features such as hand carved cornerstones. It is thought that the carving may have been done by one of the Evans family who lived at Rose Grove. The school was run and maintained by Salop County Council and known as Bettws y Crwyn Council School number 20. During the lifetime of the school, organisations in the parish frequently hired the school room from the council. the charge was five shillings per booking, and such events as whist drives, dances, parties and wedding receptions were regularly held. 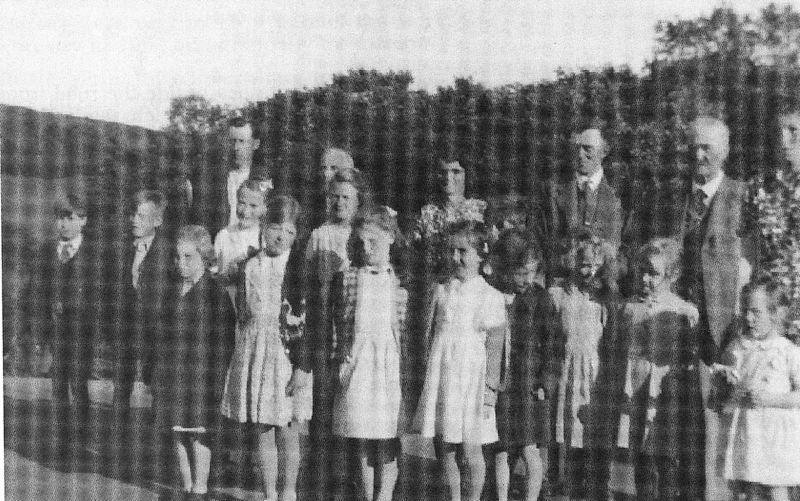 The school was originally built to accommodate sixty pupils, but when numbers dwindled to 13 in 1950 the council closed the school at the end of the summer term. Several attempts were made to get the school reopened. Salop County Council issued a notice dated 1st March 1951, which said the following: The Education Authority propose to cease to maintain Bettws y Crwyn county school. In May of that year the school managers sent a petition objecting to the closure of the school which was signed by eighty-three local electors. A reply to this was received in November, which ended The Ministry of Education after full consideration of all the circumstances in the case, approves the Local Education Authority’s proposal to cease to maintain the Bettws y Crwyn County School, and the objection raised against the proposal by eighty three government electors are therefore, not upheld. The Earl of Powis offered the school building to the parish to be used as a public hall on condition that the parish purchase the school house. The Parish Council was divided; one group in favour of a parish hall, the other wanting a church hall. After some procedural skulduggery the PCC won and the decision to transfer the school to the Hereford Diocese was made. The Diocese Board of finance readily accepted the gift of the school to be run as a Church Hall and in their ownership, however they were not willing to provide the money to purchase the School House. The Parochial Church Council was left in a predicament, and it was decided to purchase the School House themselves. Four PCC members apparently loaned a £100 each towards the purchase. There is no record of the price – the minutes not available. The account of the trials and tribulations – and generosity and hard work of the community in maintaining the hall is given in greater detail in the Betts y Crwyn book. Here we fast forward to 1995 when funds were being made available by Shropshire County Council for community use from the sale of council houses. The Parish Council was successful in obtaining £13.200 for repairs, mainly to the Hall roof. It had been a struggle to obtain this money, because it was a Church Hall, not a Parish Hall. The Parish Council was advised that it could access more funds if it could persuade the Church to lease the Hall as a Parish Hall. In 1996 the PCC had a serious problem; a new water supply was needed. Grants were available, but none to a Church run property. After two years of discussion the Hereford Diocese was asked to lease the Church Hall to the community and on 1st July 1998 the Parish Council leased the Hall from the Diocese for a term of 35 years for an annual rent of £50. the PCC made over their hall account to the Parish Hall: £3500. The Parish Hall Committee has achieved excellent results. The hall has been completely redecorated, all the facilities required to meet the new regulations have been installed. Much of the work has been voluntary. Listed below are costs and grants obtained. What is the future of the Parish Hall? In 2033 will a new lease be available? Fund raising activities produce a joint income for church and hall – the proceeds are usually divided between them. They also provide a variety os social events throughout the year. Very informative article about the history of the school, school hall and school house. It is interesting to know how much money has been raised to keep the hall going and all the grant money applied for. Thank you to all the people on the Committee.